I have some knitting projects that I’m anxious to share and a book recommendation, but that has to wait until tomorrow, the official WIP/Knit A Long day. A couple of these projects are Christmas knits, so I have to keep them on the down low. The Iknead bunch will stoop to anything to figure out what’s under the tree for them. 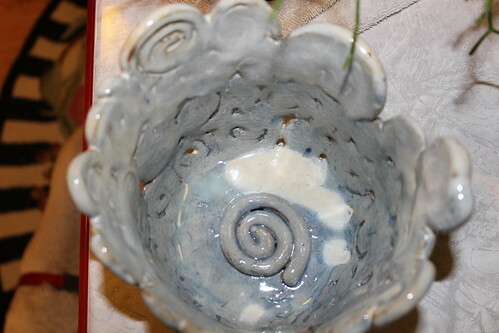 But – A bowl I made in my pottery class was out of the kiln (FINALLY) after a few false starts from the potter (me). I’m SO happy with how it turned out. This bowl was completely dipped in New Clear Glaze, with a top dip and a bottom dip in Caramel. 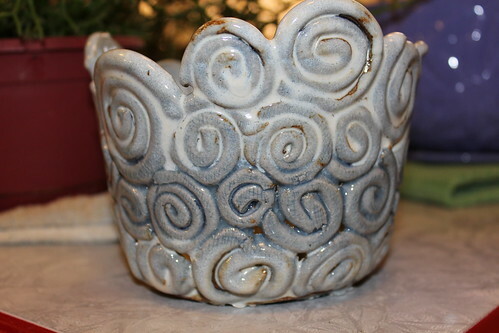 Who knew that the New Clear glaze would turn out to be such a lovely bluish gray??! I’m in love with this pot! Tub Time with the Grand Trio, right before the kid in the middle dropped a special delivery and the other two made a hasty exit! FO Friday 11/22/13, It’s Here! !